In John 2 Jesus attends a wedding in a Galilean town called Cana. Like many people at wedding receptions, it seems he took a low profile, perhaps feeling like he was on the edge of the relationships at the heart of the wedding. Besides, celebrations can be hard when a difficult reality is always on the edge of consciousness. Jesus somehow carried the emotional burden of his impending sacrifice through all he is recorded doing in the gospels. This is how I know he understands that many of us can standing smiling at a party or shaking a hand warmly and at the same time be holding off sadness or fear or grief or anger or doom. Apparently there is a freedom for miracles even in the midst of this paradox, judging by Jesus’ example in John 2. 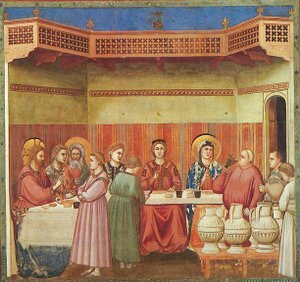 When the wine run dries Jesus is called on to intervene and he uses what is at hand: servants, clay jars, water, his own sense of what is good and right, and perhaps just a little passion for the surprising. John records that there were six jars of 20 to 30 gallons capacity. We each have a certain capacity, some days it’s 20, some days it’s 30. Either way Jesus’ command was to fill them and they were filled to the brim. He is less concerned with our actual capacity – which will vary from person to person, day-to-day, season to season – as to whether we will receive his command to be filled. And then there’s the secret art of servanthood. While everyone enjoyed the ‘best for last’ wine, John says only the servants knew where it came from. Being a servant will mean you are not usually the one at the head table tasting the wine, but it may mean you get to share in a miracle, a touch of heaven, a piece of grace, that you will treasure forever. This is the unspoken reward of serving and it is sometimes little appreciated. Never mind, there will always be those who are still and obedient enough to hear the words – ‘fill them up’ – and go into the world and do just that. Let’s be among them today – only be sure to serve ‘full’! Posted in Devotion, Food & Beverages, Musing.Tagged Jesus, John 2, miracles, wine. Previous Post Doggies bring Christmas joy!